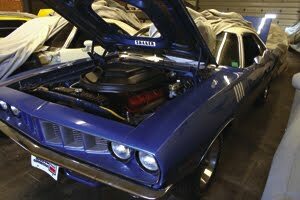 We document an unrestored, 25,000-mile ’71 ’Cuda 440 Six-Barrel for restoration and vehicle inspection reference. There’s a lot of information – and misinformation – to be found when researching the factory-correct equipment and assembly details of your favorite Mopar muscle car. Unfortunately, the ubiquity of the Internet perpetuates the bad information with repetition – making it all the more difficult to separate fact from myth. When it comes to determining the truth, it’s hard to beat factory-original, and that’s exactly what we found recently at Carman Custom, a Saginaw, Michigan-area restoration shop that specializes in Mopar muscle. The shop is owned by former NHL hockey goalie Ed Belfour. He has a penchant for Pentastar cars. The 1971 ’Cudas happen to be a particular favorite of his. During the shop’s restoration of Belfour’s own ’71 440 Six-Barrel/four-speed convertible (one of five built), the shop’s staff used another of his cars as a reference. It’s a ’71 440 Six-Barrel car, too, but a coupe. It’s a 25,000-original-mile example that Belfour purchased from the original owner. Both the coupe and convertible were built in December 1970 – in fact, they were built only a day apart! We decoded the fender tags of each and found the coupe was built on Dec. 17, 1970 and the convertible was built the next day, Dec. 18, 1970. During our recent visit, Carman Custom’s manager, Jeff Friesen, was kind enough to pull the cover back on the coupe for us to inspect. We spent time shooting under the hood and in the trunk to capture the details we think most enthusiasts would appreciate – the little things that cause head scratching during restoration or, more importantly, when inspecting a candidate vehicle for possible purchase. It’s the little things that count the most and we’ve highlighted a dozen of them here. 1 According to Carman Custom’s Jeff Friesen, restoration judges at the highest level of evaluation look for the correct, factory-installed bolts and fasteners. On E-bodies, that means many underhood bolts – but not all – should have the “G” symbol on the head, as seen in this photo. The symbol denotes the original supplier, so scour those spare parts piles and parts cars to find the right bolts. 2 There seems to be little consistency on most repainted E-bodies we encounter regarding the finish of the hood latch and support bracket. As our reference car shows, the latch bracket and its bolts are body color, while the latch mechanism and release mechanism are natural. The release spring is natural, too. 3 During assembly, the front fenders were attached to the front end of the chassis with a layer of sealer. When the fenders were cinched down with their bolts, a small amount of the sealer squeezed out along the inside edge of the fender. As our demonstration car shows, the excess sealer was never scraped off; in fact, it went through the paint shop. So, your restored car is fine with a bit of excess, body-color sealer. 4 The windshield washer reservoir was an off-white color when new, but its plastic material yellowed and hardened over time. This original, yellowed bottle shows how it looks nearly 40 years after it was installed. A couple of different reproduction versions are available, but Carman’s Jeff Friesen says one is too bright, while another’s off-white/slightly yellowed finish is more correct. And be very careful when handling an original bottle; it is likely very brittle and it’s easy to crack or push a finger through the material. 5 One of the more interesting, yet easily overlooked details of our unrestored E-body is the thin layer of black paint that’s located more or less behind the headlamp areas on the front of the radiator core support. It appears the paint was a quick, “fogged-in” job used to darken areas of the sheetmetal that might otherwise be seen through the grille. Don’t forget it when having your car re-painted – and look for it on a supposedly original-paint car. 6 With so many repainted cars to examine at car shows, auctions, etc., it’s easy to understand the uncertainty surrounding the correct finish for the hood hinges and their bolts. Our unrestored, original-paint example shows it clear and unambiguously: body-color hinges and bolts. The same goes for the trunk hinges and bolts. 7 A 1971 detail the crew at Carman Custom found out about the hard way was the correct finish for the wheel trim rings. During the judging of a rare, ’71 440 Six-Barrel/four-speed convertible they restored, they were marked down for its bright-polished trim rings. The rings should have had a natural/brushed finish, as our reference car shows. 8 What you’re looking at here is the original spare tire inflator bottle from our unrestored model. Reproductions are available, but they tend to have a shinier finish. Also note the “35670” marking on the bottom of the bottle. It is the date code for the bottle and decodes as the 356th day of 1970 – or December 22. It can be an important way of verifying a claim of “all original” equipment. In this case, the date code is in line with the car’s “12/70” door tag information and “C17” fender tag code that indicates a Dec. 17, 1970 build date. Presumably, the spare tire and inflator were installed after the car went down the assembly line. Note, too, the correct blue color of the bracket that holds the bottle on the spare tire, as well as the yellow cap on the bottle. 9 Seen here is a 1971-specific vent tube that is part of the emissions system. It is found on at least 340-, 383- and 440-powered ’71 E-bodies. Along with the specific hard line and hose, there’s also a unique breather that connects with the hose. It may be a small detail, but it’s an important one. 10 As far as we can tell, all of the 1971 trunk lids have access holes cut into the bottom to support the installation of a rear wing – regardless of whether the car actually received the option. This example wasn’t ordered with the wing, but the factory sprayed black paint into the access holes, causing overspray and runs around the edges. While an interesting production footnote of its day, such a detail would hardly be acceptable in today’s production. 11 It is believed this heater hose is original to our reference car. And while reproduction hoses are offered with the Pentastar symbol and numbering, a few don’t seem to have the correct font (type style) for the numerals or grooves in the rubber (seen at the bottom of the example here). If you’re shooting for a factory-correct resto, make sure the replacement hoses have the correct numeral style and grooves. 12 The sticker with the “45” on it is located on the power brake booster, but we don’t know what it references in regard to the car or brake system. In fact, we can’t recall seeing a car in recent memory – restored or unrestored – that had the same sticker. At any rate, it was on our reference model. If you know its purpose or reference designation, please e-mail us and we’ll let all our readers in on the secret. If there’s one certainty in the world of Mopar restorations, it’s that little is certain. Take the example of the 1971 taillight panel nameplates seen here. In the one photo, there’s no ’Cuda badge above the “By Plymouth” badge, as there should be. The car in question is the same, un-restored, 25,000-mile example used to illustrate the main part of the story. The original owner says the car was missing the adhesive ’Cuda badge the day he took delivery. The other photos show the correct Barracuda and ’Cuda badges, but there’s a catch: Both are affixed to original ’71 Hemi cars. If the standard convention was followed, cars with 440 and Hemi engines all should have come with ’Cuda badges, but it appears at least one slipped through with the wrong nameplate. Given the car in photo A received no nameplate whatsoever suggests assembly line mistakes were relatively common – and it reminds us to never say never when it comes to documenting the history of Mopar’s muscle cars. The ’71 ’Cuda depicted in our main story also served as the primary reference during the restoration of owner Ed Belfour’s other car: a one-of-five ’71 ’Cuda 440 Six-Barrel/four-speed convertible (12 more Six-Barrel convertibles were built with the automatic transmission). He bought the car around 1990 and waited more than 15 years to restore it, but when he did (through his own Carman Custom resto shop), his goal was gold certification in the O.E. class at the Mopar Nationals. He received it with an absolutely stunning car. Using as many NOS parts as possible, including trunk pan, front fenders, fender gills, mufflers and even NOS tires, the car is a shining example of one of the rarest Mopar muscle car models. Curiously, it was originally ordered with leather seats, but no console; and exterior is as plain as plain can be – no rear wing, billboard stripe or Shaker hood. It’s simply a clean, mean Mopar machine. The fender tag is one of the essential identifiers of Mopar muscle cars. Its alphanumeric codes detail the vehicle’s original equipment and options. There are several printed and Internet sources that help decode the tags; we used the online decoder at www.stockmopar.com. If you’ve never decoded a tag before, the information starts at the lower left corner, not the upper left. So, decoding begins with the “E87” code on the tag in the accompanying photo. It’s the fender tag for the 25,000-mile coupe used in our main story.